Earlier this week was the formal unveiling of Kaby Lake, Intel’s 7th generation Core CPU architecture. And while Kaby Lake was the focus of Intel’s efforts for obvious reasons, as it turns out it’s not the only processor family the company has launched this week. Taking off alongside Kaby Lake is its budget counterpart, Apollo Lake. Built off of the latest generation of Intel’s Atom-derived line of CPU cores, Goldmont, Apollo Lake is destined for low-cost devices such as basic 2-in-1s, laptops, and netbooks. In the saga that has been the life of Intel’s Atom processor development over the past 8 years, Apollo Lake comes in what’s best described as the dramatic, angsty years. Earlier this year Intel partially canceled the Broxton SoC. The de-facto flagship for Atom this generation, Broxton would have gone into modern smartphones and tablets. Instead Broxton was scaled back to just appearing in embedded products such as Joule. 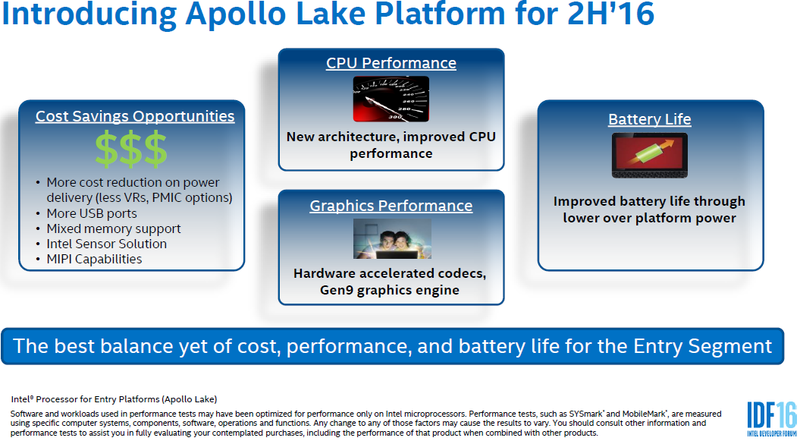 Instead, Apollo Lake would be the consumer flag bearer for this generation of Atom. Apollo Lake is the successor to Braswell, and like its predecessor is a small die SoC designed to slot in below the Core architecture chips, to go into low-cost devices like netbooks. In terms of press announcements, Intel never gave Braswell a lot of attention; it received a similarly quiet launch in 2015. However it and Apollo Lake are still an important part of Intel’s chip lineup, enabling Intel to reach cheaper markets and better compete with non-traditional devices based around ARM SoCs. Apollo Lake has been on Intel’s roadmaps for a while now, and received a formal introduction (of sorts) at IDF Shenzhen earlier this year. While Intel didn’t go into exhaustive depth on the architecture, it was revealed that it would use the new Goldmont CPU core, the first architectural upgrade to the Atom line of CPU cores since Silvermont in 2013. Furthermore it would integrate a newer GPU design based on Intel’s Gen9 GPU, offering modern GPU features and better performance. What we didn’t know at the time was what the SKUs would be like and when they would launch. But with this week’s launch we finally have our answer. Apollo Lake is composed of 6 SKUs – 3 desktop and 3 mobile – running under the Pentium and Celeron brands. So without further ado, let’s look at the SKUs. We’ll start with the desktop parts, which are somewhat awkwardly split between the Pentium J4-series and the Celeron J3-series. Like the past generation, the Pentium is the highest performance, highest priced SKU. The CPU frequency tops out at 2.6GHz, and it features a full, 18EU HD Graphics 505 iGPU implementation, which itself maxes out at 800MHz. Of note here, along with the various architectural enhancements, Apollo Lake has a few other significant changes relative to the last-generation Braswell Pentium. The GPU EU count has been increased slightly from 16 EUs to 18 EUs. And the number of PCIe 2.0 lanes coming off of the chip for peripherals has been increased from 4 lanes to 6. However what has also increased is the TDP, which sees a 54% jump from 6.5W to 10W. As Apollo Lake is made on Intel’s 14nm manufacturing node like Braswell before it – and with there being no sign that it’s using the newer 14nm+ variant like Kaby Lake – Intel doesn’t get the benefit of a new node for this generation. Instead all of the architectural enhancements and performance gains relative to Braswell consume additional die space and power. As Intel has not briefed us on Apollo Lake it’s not clear just why power consumption has gone up like it has, but this may be a combo effect of the newer CPU and GPU. At the same time it’s worth noting that CPU clockspeeds have not changed and GPU clockspeeds have only increased slightly, so Apollo Lake’s performance benefits are almost entirely going to be derived from architectural enhancements and the overall wider iGPU. In practice I don’t expect this TDP increase to cause much trouble since these are desktop parts, but it is none the less a bit surprising to see. As for the cheaper Celeron parts, these are split between the 4 core J3455, and the 2 core J3355 (ed: why couldn’t this be 3255?). Both feature a scaled down HD Graphics 500 GPU with 12 EUs, and overall lower clockspeeds. The 2 core version gets you the better clockspeeds over the 4 core version, in particular shipping with a much higher 2.0GHz base clock. However it has the lowest GPU clockspeed of all 3 desktop SoCs. Meanwhile the mobile side, we see a very similar picture as with the desktop parts. Everything is clocked lower, otherwise the Pentium N4-series and Celeron N3-series share the same product differentiation. The Pentium is the only HD 505 GPU part, while the Celerons are split between 4 CPU cores and 2 CPU cores. I had to double-check this to make sure, but the much lower base CPU clock of the Pentium N4200 versus last year’s Braswell-based N3700 is not a typo; the mobile Pentium really has lost 500MHz at the base. 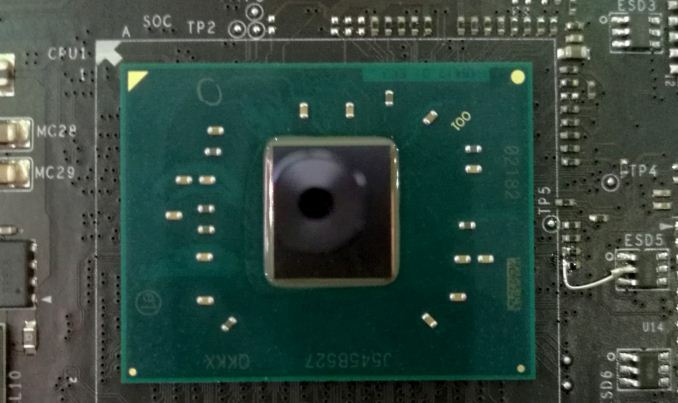 Considering that all of these parts remain at 6W – avoiding the TDP increase of the desktop parts – it stands to reason that Intel had to cut back on the base clock in order to hit their TDP target. This makes the performance gains from the Goldmont architecture critical, as should the average clockspeeds be lower versus Braswell, then Goldmont needs to more than offset the loss in frequency. On that note, it’s also worth pointing out that Intel has not launched any 4W SKUs this time around, whereas Braswell launched with 1 such SKU. This means that the nominal TDP of all of the Apollo Lake mobile SKUs is higher than the 4.5W TDP of the new Kaby Lake Y-series processors (cTDP-Up withstanding). Actual power consumption is a bit more complex than this – so this doesn’t necessarily mean Apollo Lake draws more power on average – but it means that if you want a current-generation ultra-low power SoC from Intel, then your only option right now is to go with Kaby Lake. I believe that this means that we can also rule out Apollo Lake for traditional tablets. 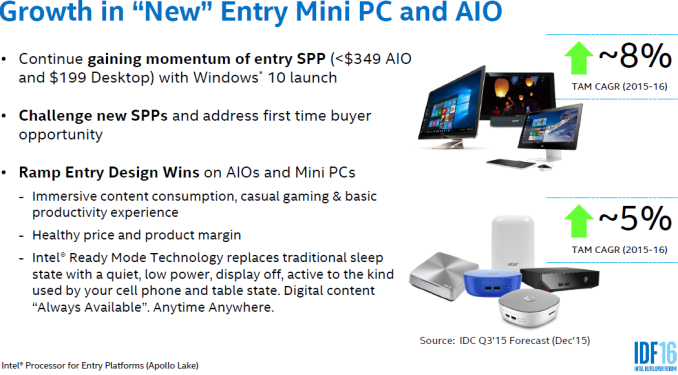 When Intel cancelled Broxton, they made it clear that this included Broxton for tablets as well; however it was unclear whether Apollo Lake could be stretched down to fill that role. Given these TDPs, it’s unlikely we’re going to see Apollo Lake in the kinds of tablets that Cherry Trail-T could go in. And this doesn’t even factor in other potential road blocks such as chip size (Apollo Lake has a wider 2D footprint) or any missing features for mobile devices that Broxton would have included. As this is the cheap Intel chip someone could still take a stab at it, but Intel is clearly trying to push partners towards 2-in-1s rather than simple tablets. Finally, though the desktop parts feature this as well, I think it’s more useful with the mobile parts to point out that Intel has added support for S0ix sleep states to the CPU. This was first introduced in the Atom architecture with Clovertrail, a smartphone/tablet SoC family, however this feature wasn't previously available with the more powerful desktop/mobile SoCs. 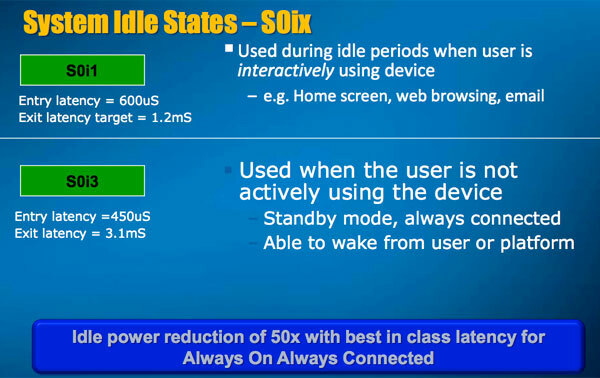 S0ix states offer more flexible sleep states and improved idle power consumption. In terms of functionality, this is necessary for Apollo Lake to support Windows 10’s Modern Standby feature, something that Braswell wasn’t able to support. Getting back to performance and architecture, because Intel hasn’t briefed the press on Apollo Lake, we unfortunately have very little to go on. 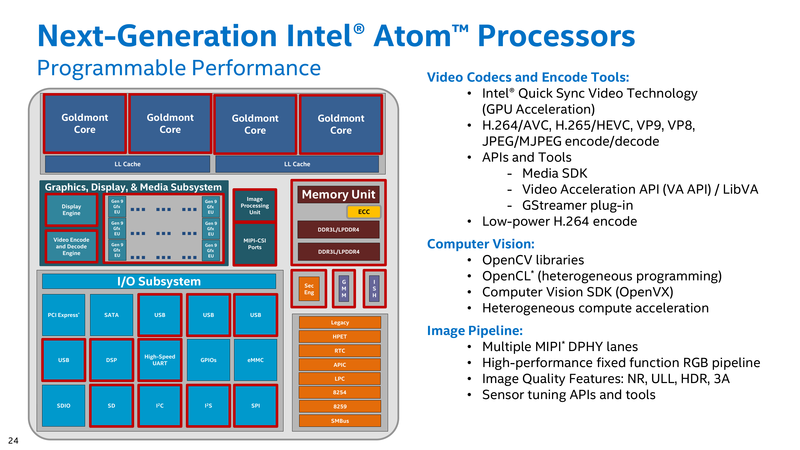 In particular, Intel has not released much in the way of details on the Goldmont CPU architecture, so we still don’t know much about it other than previous announcements that it’s meant to be a significant upgrade from Silvermont/Airmont – being the Tock in the Atom CPU development roadmap. Just what Intel has done will have to remain a mystery for another day. On the GPU side of matters however, since Atom is inheriting the existing Gen9 GPU we’ve seen since Skylake, things are a lot clearer. Architecturally, Gen9 is not a radical departure from Gen8, but it’s none the less a more efficient and capable GPU architecture from Intel, supporting the more modern Direct3D Feature Level 12_1 feature set. Other, under the hood features like memory stream color compression mean that Gen9 can more efficiently use the limited memory bandwidth available on the SoC, which as we’ve seen elsewhere, can sometimes significantly improve GPU performance. Meanwhile on the media side of matters, the media encode and decode functionality is similarly upgraded, bringing it up to par with Skylake. Relative to its direct predecessor, Intel has gifted Apollo Lake with significantly better capabilities than Braswell, including full hardware acceleration for HEVC Main Profile (8-bit) and VP9 video decoding. This means Apollo Lake devices can now decode video encoded with the latest generation codecs for very little power, which will be important as more devices and services adopt these codecs. However potential HTPC users will want to note that HEVC Main10 support is not included, so Kaby Lake continues to have an edge for newer premium content services. Finally, as far as performance goes, Intel has released some basic numbers in their marketing materials. In comparing the mobile Pentium N4200 versus the most powerful mobile Braswell SOC, the Pentium N3710, Intel is promoting that the N4200 is 30% faster in SYSmark 2014. Meanwhile they’re reporting that the same setup is 45% faster with 3DMark Skydiver. On the CPU side, keeping in mind that the two chips have a maximum turbo clock within 60MHz of each other, the performance gains are significant. While it’s unclear if Intel keep memory bandwidth the same (Apollo Lake supports LPDDR4, Braswell does not), it either way hints that the Goldmont CPU core offers significantly higher IPC than the older Airmont CPU core. This is only one test – and from the manufacturer at that – but it will be interesting to see how well other benchmarks respond to Goldmont once we get our hands on Apollo Lake devices. At the same time, for performance to increase by 30% despite the much lower CPU base clock, this indicates that Intel is likely still coming out well ahead even if they had to pull back on frequencies a bit due to power consumption. As for the iGPU performance, a 45% increase is a combination of factors. Just by the raw numbers, the Apollo Lake Pentium has a 20% GPU throughput advantage due to its higher GPU turbo frequency and overall wider GPU configuration. At the same time this accounts for less half of the reported performance increase Intel is reporting. So we are also seeing the overall performance and efficiency improvements of the Gen9 GPU architecture in action. Wrapping things up, while this week marks the formal launch of Apollo Lake, it will be a bit longer before we see the first devices show up. The quiet nature of Atom launches means that there aren’t any devices on the market on day 1, so over the coming weeks we should see device announcements from the usual parties, ramping up in time for the holiday season. People who primarily use computers to watch stuff and primarily use their heads for balance and to wear hats will rejoice.